INDIANAPOLIS (CNS) — The unseasonably warm weather in Indianapolis Jan. 3-7 was good news for the 17,000 participants of the Fellowship of Catholic University Students’ SEEK2019 conference in Indianapolis. It was also good news for the city’s homeless. According to the National Alliance to End Homelessness, nearly 1,700 people are sleeping in temporary shelters, transitional housing or on the streets on any given night in Indianapolis. Those people had more good fortune than just mild temperatures during the FOCUS conference. They benefited from a donation drive. 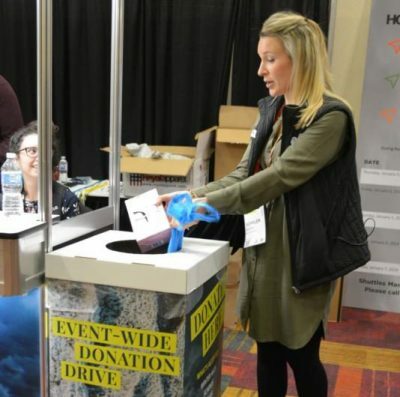 SEEK attendees filled 30 50-gallon bags with winter hats, gloves, scarves and socks, as well as toothbrushes, toothpaste, deodorant and other hygiene items — all to help the homeless and others in need in the city. Kathleen Tierney agreed. She is coordinator of the Garden Door Ministry, which feeds and clothes the homeless who live near the downtown parish. FOCUS, started in 1998, seeks to form intentional disciples by send missionaries to colleges and universities. There are currently FOCUS missionaries serving on more than 150 campuses around the world. Indiana University-Purdue University Indianapolis is one of three FOCUS campuses in the Archdiocese of Indianapolis. St. John the Evangelist serves as the faith home for the two universities’ FOCUS missionaries and many of its Catholic students. And selecting the archdiocese’s Catholic Charities — which celebrates its 100th anniversary this year — was a way to give back to the community that hosted SEEK2019. — Holy Family Shelter, which houses approximately 350 families and more than 500 children each year. — The Crisis Office, which provides food, clothing, rent and utility assistance to low income individuals in need. — Refugee and Immigration Services, which offers refugees pre- and post-arrival help, job assistance, housing and basic acclimation into society. — Senior Companion Program, which connects seniors with homebound elders to offer friendship and help with daily tasks. “We originally expected to get 25 50-gallon bags-worth of donations,” said Chamblee. “In the end, we had enough to fill 30 bags. Tierney said the “Garden Door neighbors are very appreciative (of the items). We’re just always running short. There’s such a great need.